Kulinarya was started by a group of Filipino foodies living in Sydney, who are passionate about the Filipino culture and it's colourful cuisine. Each month we will showcase a new dish along with our family recipes. By sharing these recipes we hope you find the same passion and love for Filipino food as we do. This month's theme is Pinoy BBQ! Filipino's love BBQ. In Philippines, when walking down the small streets in my Auntie's subdivision, people are barbecuing all sorts of meat in front of their homes to sell. Some meats I know, some... hmmm, I don't want to know. But, no matter what is cooking on their barbecues, it always smell so enticing. The smell of barbecues gets me drooling all the time. Barbecue is another one of those foods that are always present at a Filipino gathering. It is also found at all Filipino Fiestas. Most especially, barbecue pork on skewers. Marinade for the pork skewers is very simple. I don't usually measure out the ingredients but play it by feel. The main ingredients I always include is lemonade, tomato sauce, pineapple juice, sugar, salt and pepper. The marinade needs to be thick so it can coat the meat. Sometimes, if I find that the marinade is a little thin after marinading the meat, I place in a small pot and reduce it. I then baste the meat with the thickened marinade. It is currently Winter down here in Melbourne, so it was very cold when we were barbecueing (or should I say, Hubby and my dad, were barbecuing). However, no matter the temperature or weather outside, barbecues are always welcomed at meal times. 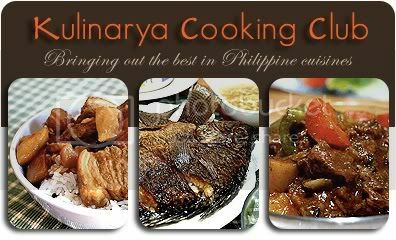 It's great to have Kulinarya Cooking club to showcase Filipino foods. It's hard to find somewhere or restaurants to taste Filipino cuisine here in Australia. At least, I can see how good the foods look like via your blog and other participated food blogs. I love your recipe for the pork barbecue, tomato sauce and pineapple juice--yummy! I look forward to this every month. I am learning so much from it and also from visiting other bloggers. your three way are all delicious. I'm more interested w/ the squid. Raw sugar? can we use brown sugar or are they the same? what kind of dipping sauce goes w/ this? This bbq sounds terrific! The squid especially is very tempting to try! The squid looks so good. They looks so fresh. I wish we had that type of seafood available here. I always loved Pork BBQ and yours loooks great. Wow, you blew that theme out of the water! I'm hungry again, and I just had breakfast! Wooaa - three types of BBQ? That's fantastic - my favourite would definitely be the squid! WOW, you had a BBQ blowout! Love the assortment of meats you made, you went all out :) Love the squid with sugar filling, don't think I've had that before, will try it soon since it's grilling time now. Give me bbq squid with chilli sweet soy sauce anytime!!! I'm going to try the grilled pusit!